Home » Health & Wellness » Trying something old, but also new (to me anyway). The struggle continues folks! Age plus a sedentary job plus being out of commission due to a foot surgery have all taken their toll to put me at my heaviest I’ve ever been. When my company offered up an opportunity to take part in a beta test for a wellness program, I hopped on the bandwagon. I’ve been combining that wellness plan with some wearable technology to try to keep me on track. This is the first in a two-part post to review my experiences with both the wellness program and the newer wearable technology in my life. The last time I talked about fitness apps, I was an active participant in Weight Watchers. Over the years, I have continued to go back and forth with Weight Watchers (and My Fitness Pal) with limited success. Sadly, during my last round, I had a very hard time staying within my points range without constantly being hungry and cranky – and then I had my foot surgery looming, so I stopped. 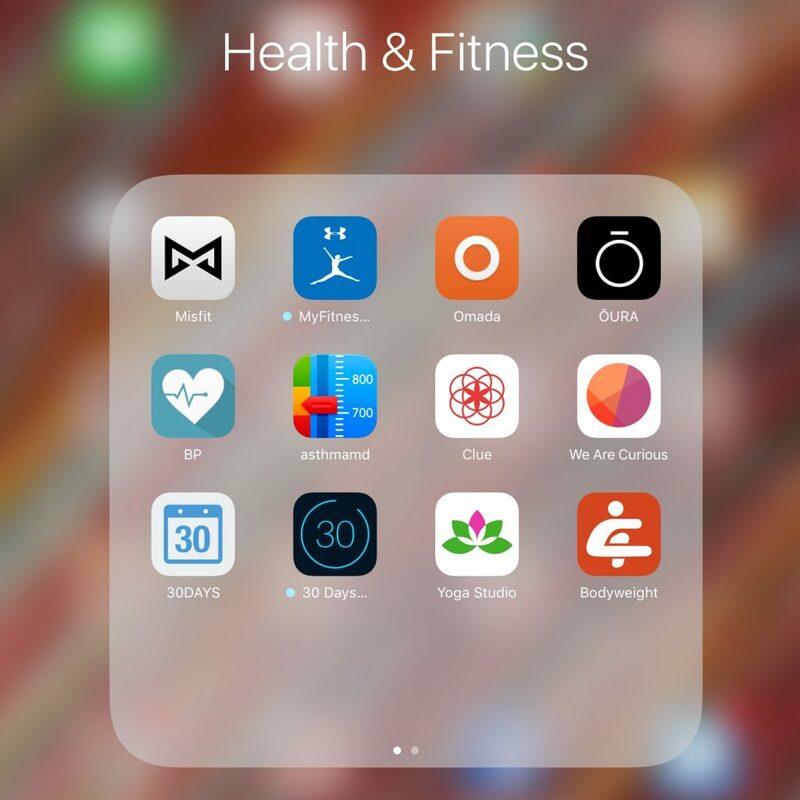 As you might surmise from the screencapture from my phone, I still use My Fitness Pal on occasion – the program that my work offered participation in is provided via Omada Health. The app is nothing spectacular, and is actually very simple compared to other tracking apps. The program is a small group program offered online with oversight by a Health Coach. Interaction with the health coach is via private messages and group messages. The program lasts a minimum of 16 weeks – with weekly online lessons and posts from the health coach. Similarly to Weight Watchers, Omada focuses on shifting into a healthier lifestyle. Unlike Weight Watchers with its points focus, Omada is much more general with food tracking and tries to encourage and teach better habits and food selection. One thing that surprised me was the recommended macro nutrient breakdown – it was definitely much higher in protein and fat than I normally had been eating. Historically, I ate more in line with a 50:30:20 caloric breakdown of Carbs:Protein:Fats (though honestly sometimes the fat and protein got flipped) – Omada recommends something more along the lines of 50:30:20 Fat:Protein:Carbohydrates – which is getting more into line with what is called a ketogenic diet. I’m slowly getting more in line with this ratio, though I’m probably still consuming more calories from carbohydrates than is ideal. In any case, since this is supposed to be a lifestyle change, I’m working on getting myself as close to that ratio as I can while still being happy with what I eat, which means I still eat baked goods, baked potatoes and quite a bit of fruit. 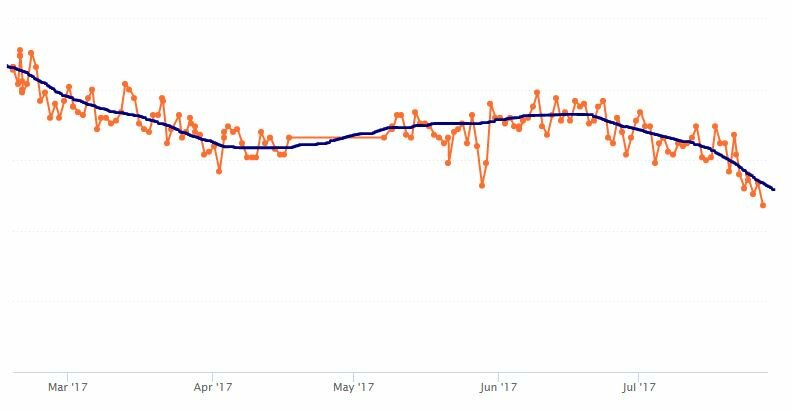 As you can see, I successfully started dropping weight, but then plateaued/gained….and then in June I overheard someone talking about The Obesity Code and their success in following the tips mentioned within. Ever the skeptic, I picked up a copy from the library to give it a read and make up my own mind about it. The book itself is quite a quick read. It focuses on the role of insulin and how it relates to weight gain/loss, and specifically, it discusses the use of fasting (combined with the Low Carbohydrate High Fat diet) as a tool to drop insulin levels to facilitate fat burning. Still skeptical, I figured I’d give the whole intermittent fasting thing a try while also trying to make better choices, focusing on the typical things like eating more whole foods (while consciously trying to eat fewer carbohydrates), being mindful of portion sizes and being aware of hunger cues. And while I can say I definitely have not been faithful to a strict low carbohydrate diet (I still eat cookies, ice cream, rice, pasta, bread, fruit and starchy vegetables), I have been pretty good about the intermittent fasting part – I generally follow an “alternate day” fasting regimen on Mondays, Wednesdays and Fridays – meaning I have coffee with some cream in it in the morning and then don’t eat anything until dinner time. While my weight still jumps around from day to day, I’m definitely back on a downward trend as far as my weight goes. 1) I had been eating by clock as a force of habit, rather than because I was actually hungry. 2) Fasting until the evening is not as hard as I thought it would be – I have not yet tried a multi day fast, and I don’t know if I will. 3) I really like carbohydrates and I feel it would be a real struggle for me to commit to a strict Low Carbohydrate diet. 4) I am not entirely sure, but I think my blood pressure is also slowly dropping (I’m not as good at routinely checking my blood pressure as I am with my weight). 5) Surprisingly (to me) I don’t typically find myself going overboard with eating after I’ve fasted for the day. 6) I sometimes wind up fasting during the day on weekends because I’ve gotten more in tune with eating only when I’m hungry. Have you tried Intermittent Fasting or eating a Low Carbohydrate High Fat diet? I’d love to hear your about your experiences.